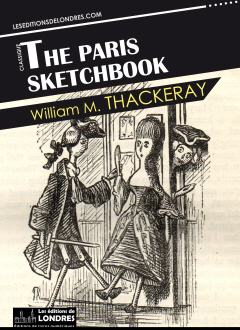 The Paris sketchbook is a travel book published by William Makepeace Thackeray starting in 1831, and published as a compilation in 1840. The book was originally published chapter by chapter in various magazines and then compiled into a book which generated significant success along with the The Irish sketchbook. Witty, scholarly, full of anecdotes, insights, historical references, and a constant comparison between what he sees as the French and the English character, the Paris Sketchbook is a blast from the past with surprising topical observations, which tends to demonstrate that culture “never changes”. An invasion of France, a caution to travelers, the Fêtes of July, on the French School of Painting, the painter's bargain, cartouche, on some French fashionable novels, a gambler's death, Napoleon and his system, the story of Mary Ancel, Beatrice Merger, caricatures and lithography in Paris, little Poinsinet, the Devil's wager, Madame Sand and the new apocalypse, the case of Peytel, French dramas and melodramas, meditations at Versailles.